Message from the Cap’n is a compilation of fishing advice, waterman and weather insights, Chesapeake lore, and ordinary malarkey from the folks who keep their feet wet in the Potomac and St. Mary’s rivers. From the Interpretive Buoy System the water temperature in the Lower Potomac is nearing 56 degrees and the salinity is up to 9 PSU (practical salinity unit). 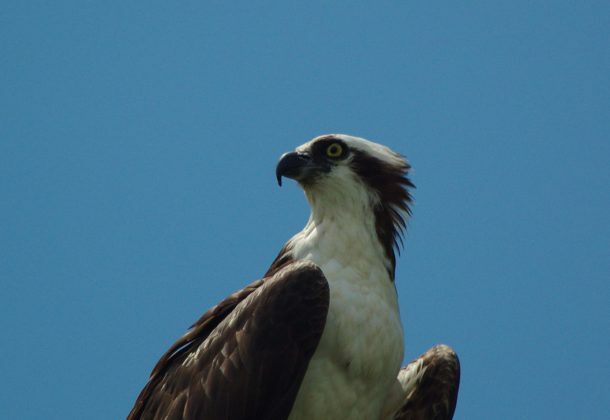 *Ospreys generally mate for life but will pick up another partner after the death of one or the other. *The males usually come first and wait for their mate to arrive. They travel up and down the 77th parallel when migrating. * Males are smaller and have no dark necklace on their breast. *Both sexes tend the nest to keep predators at bay. The ospreys in front of my home last year changed the guard around noon every day. *They raise from one to four young depending on the weather and food supply in April through July. *Young birds strengthen their wings extensively before their first flight in July. They are always interesting to watch during their first flights. *After the young birds can fish to feed themselves, the adult birds leave them here in the fall and return to South America to overwinter. More observations about the Osprey.